New P&G Rebate: Buy $50 Get $110 in P&G Savings! Update: This actually starts 8/20/10 not 9/1 like I stated. So, go ahead and use your new coupons right away. (Thanks Ueen!). And, I am seriously making an appointment at the eye doctor. These reader glasses from CVS are just not working for me anymore. Yikes, I am getting blind as a bat! If you have a list of things you want to run out and buy with coupons from the new P&G insert coming out this Sunday, you might want to wait until September 1st. From 9/1 – 12/31, save your receipts with P&G product purchase. 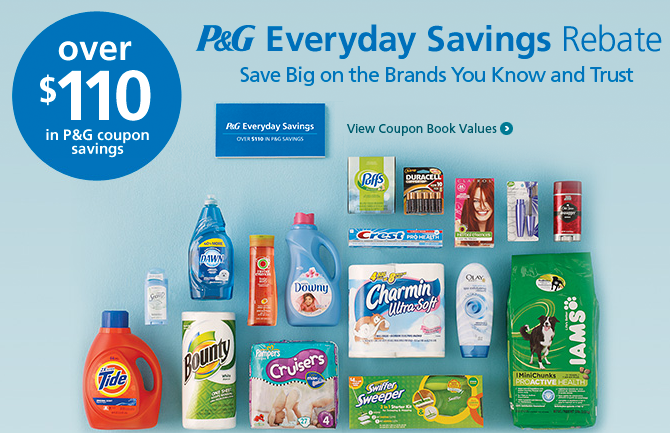 Once you have purchased $50 worth you can then submit for a P&G coupon book with over $110 in P&G coupons. You can head over here to print out your rebate form. And you can head over here to see more information, coupons & samples.